Brooklyn’s own Morbid Anatomy, which busies its beautiful self “surveying the interstices of art and medicine, death and culture,” is going on a field trip this Saturday. On Saturday, July 16th join Observatory and Morbid Anatomy for a special field trip to New Haven, Connecticut. 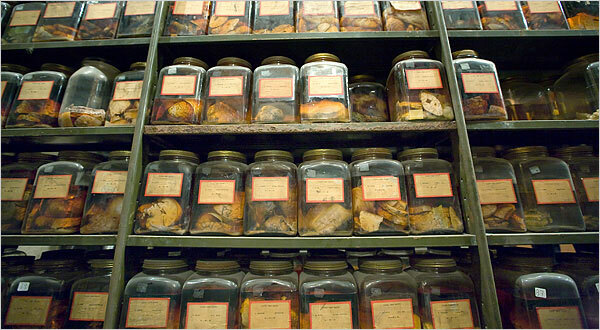 Our first stop will be the amazing Cushing Collection, with its over 500 human brains in glass jars and haunting pre- and post-operative photographs amassed by “father of modern neurosurgery” Dr. Harvey Cushing. We will be introduced to this collection– newly open to the public–via a guided tour by Terry Dagradi, curator of the collection. Our next stop will be the historic and lovely Institute Library (founded 1826), Connecticut’s oldest living independent literary institution and one of the last remaining membership libraries in North America, where director Will Baker will give us a tour followed by an opportunity for unguided exploration and lunch. Next, we will be treated to a special after-hours tour of the Center Church Crypt, an underground cemetery featuring 137 grave stones of New Haven’s founders and earliest citizens going back to 1687. Our final stop will be an unguided visit to the incredible Beinecke Rare Book and Manuscript Library before hopping on the bus for our return home. If you’ve been reading this here blog, you know I’ve had a bit of blushing words to say about Proteus Gowanus, which houses both the collection and library of Morbid Anatomy. So, to have the opportunity to go on a road trip with said Anatomy sounds delightful. I’d be particularly interested in checking out the Center Church Crypt. I could get into any one of those bullets. Not to mention, the crypt is a part of the United Church of Christ in New Haven, the UCC being one of the more progressive lineages of Jesus-God-centric faith out there. Funny enough, there’s a tiny little home church on my block called the All Souls Bethlehem Church that’s somewhat aligned with them, and it’s a beacon of social justice light!